The open center, or vase-shaped, system is the most commonly used on system and can be used on the majority of fruit trees and almonds. 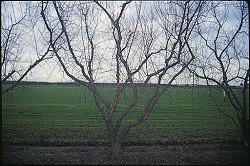 The center of the tree is kept free of large branches and vigorous shoots, particularly during the growing season, in order to allow sunlight to reach the lower fruiting branches. Begin by cutting back the tree at knee height at planting (bare root only). As shoots grow, you can select 3 or 4 shoots to become the main scaffold branches, or you can wait until winter to make the selection. The branches are headed around 2 to 3 feet long, and two shoots that grow below each cut are later trained upward and outward. Continue training upward and outward in this fashion until the full height is reached. 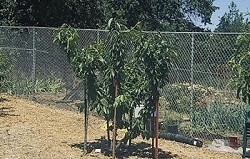 Be sure to leave spurs or (for peaches and nectarines) one-year-old branches along the main branches to produce the flowers and fruit. You can circle a strong rope around the scaffold branches about two-thirds up the tree to support the branches with the weight of the fruit. Training an open center cherry tree at the Horticulture Center. Because cherry shoots grow strongly upright, they need to be tied or staked outward; this also slows growth and increases fruiting. 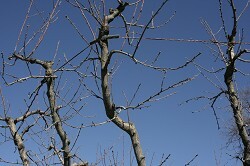 Mature open center peach tree. Rope tied around the open center peach tree to prevent limb breakage.